All NEW: The Cruelty Men More Bread or I'll Appear Baby Zero Breakfast in Babylon The Pig Who Danced Pooka Why is the Moon Following Me? Emer Martin is a Dubliner who has lived in Paris, London, the Middle East, and various places in the U.S. Her first novel Breakfast in Babylon won Book of the Year 1996 in her native Ireland at the prestigious Listowel Writers’ Week. Houghton Mifflin released Breakfast in Babylon in the U.S. in 1997. More Bread Or I’ll Appear, her second novel was published internationally in 1999. Emer studied painting in New York and has had two sell-out solo shows of her paintings at the Origin Gallery in Harcourt St, Dublin. Her third novel Baby Zero, was published in the UK and Ireland March 07, and released in the U.S. 2014. She released her first children's book Why is the Moon Following Me? in 2013. Pooka is a Halloween book for children released in 2016. Her latest children book The Pig who Danced was released in 2017. She completed her third short film Unaccompanied. She produced Irvine Welsh’s directorial debut NUTS in 2007. Emer was awarded the Guggenheim Fellowship in 2000. She now lives between the depths of Silicon Valley, CA and the jungles of Co. Meath, Ireland. Emer Martin is a Dubliner who has lived in Paris, London, and the Middle East and in many places in the United States. She fled Ireland at age 17, finding it to be insular and oppressive, and began to wander through Europe. She was exhilarated and relieved to find herself alone in Paris drifting from cinema to cinema and finally discovering a tribe of wanderers, dreamers, refugees, and hustlers on the slopes of the Pompidou Centre. Her first novel, based on her travels was Breakfast in Babylon, described the life of a young Irishwoman in the Parisian underworld and won Book of the Year at the 1996 Listowel Writers' Week. When it was published in the U.S Emer became part of the 90s zeitgeist writers and connected with the Scottish writers and Rebel Inc. She did many tours of the U.S and Europe. They were dubbed The Repetitive Beat Generation in a book that featured many of the faces on the scene such as Irvine Welsh, and Alan Warner. Emer lived for ten years in Manhattan in the East Village and co-founded a group of Irish women artists and troublemakers known as the Banshees. They performed all through the cult venues of the time such as Fez, The Knitting Factory, Max’s Fish, and took the show on tour throughout the U.S. Martin studied painting in New York and graduated from the Thomas Hunter Honors Program of Hunter College as class valedictorian in January 1998 More Bread Or I'll Appear, her second novel, was published internationally in 1999. She was awarded the Guggenheim Fellowship in 2000. Ever restless, she left for California where she completed a MFA in Cinema in San Francisco and directed short films and sold screenplays. Emer returned to a transformed Ireland in 2004, she taught writing in Trinity College Dublin and pursued her passion for painting. She recently shot her third short film Unaccompanied and produced Irvine Welsh's directorial debut NUTS in 2007. Living on a cottage on the edge of the world at the Cill Rialaig Artist retreat she began to paint images from the complex folktales collected by Sean O’Conaill the renowned storyteller. She has two sell-out solo shows of these paintings at the Origin Gallery in Harcourt St, Dublin. Baby Zero was published in March 2007 by Brandon Publishers, and released internationally through the publishing co-operative Rawmeash based in the Bay Area California. 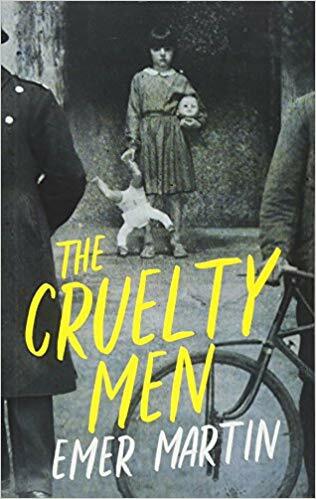 Emer rented a studio on a farm in Co. Meath by the Boyne River and wrote The Cruelty Men, a trilogy of books on displacement and dislocation within the island of Ireland through the eyes of two interconnected families. The series is in keeping with her entire body of work, written in rage, resistance and a rejection of resignation. Resistance is a refusal to accept the condition we find ourselves in. Art can speak to power by subverting the rational and opening up new possibilities. Can writers and artists dream new worlds in to existence that can stand against a monolithic globalized corporate consumer society? Ireland has long had a tradition of rebellion. Emer Martin ‘s darkly comic work examines power and the abuse of it. Her characters have always been like the dogs howling at the edge of town. She is the founder of Rawmeash, the artist led publishing cooperative www.rawmeash.com. They have published Catherine Teeter’s novel Russian Lessons. among others. Emer Martin says "At 15 I was a punk. Most of the music was terrible, I forced myself to listen to it. I wanted to grasp its energy. I liked the ideas: do it yourself, take control, break down old barriers, tear up traditional structures, flip the hierarchies. Rawmeash is an idea that I have longed to make into reality. A nonsense fiction. And I’m good at nonsense fictions. This is a publishing co-operative run by artists for artists." Through Rawmeash she has published three children’s books, Why is the Moon Following Me?, Pooka, and The Pig who Danced. She returned to California in 2014 where she is currently teaching and writing and painting and resisting. Share book reviews and ratings with Lisie, and even join a book club on Goodreads. Why is The Moon Following Me?